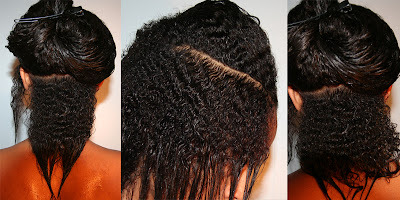 Don't Confuse Hair Thickness w/ Hair Growth! I do this often myself... then I have to realize the truth about Natural Hair! My beautiful friend Eureka has lovely long natural hair, in fact, I featured her "Hair Story" here on 'Natural Expression' (Visit Featured Hair Stories in the Tab Area), anyway I informed her that I wanted my hair to be thick, Really Thick like hers! She then put her fingers in my hair and said, "Girl, How thick do you want it? Your hair is already thick!" I looked at her, and said to myself, "Duh Shren, my hair is thick!" I didn't even mean that, I meant to say, I want my hair to be long. Like Yours!